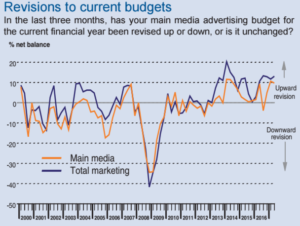 Marketing budgets are being sustained at a robust rate, but Brexit, political uncertainty, and rising inflation are impacting financial prospects, reveals Q2 2017 IPA Bellwether, released this Wednesday (19 July). 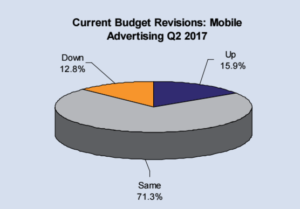 The Report, which has been conducted on a quarterly basis since Q1 2000, showed that over 28% of the survey panel recorded an upward revision to marketing budgets, compared to around 15% that recorded a fall. The resulting net balance of +13.1% was up from Q1 2017’s +11.8% and the best recorded since Q3 2016. Despite an upswing in marketing budgets, there was widespread evidence that higher marketing expenditure was being used as a defensive tactic. For example, as a response to fiercely competitive marketplaces, or to support brands at a time of economic uncertainty, softer demand and slower growth in incoming new work were all weighing on company expansion. Increased marketing spend was broadly concentrated in the digital space during the second quarter, with the latest survey showing that internet budgets were raised to the greatest degree in just under a decade. 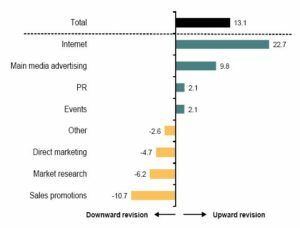 Annual ad spend forecasts through to 2020 are unchanged, driven primarily by an underwhelming performance in business investment, which is forecast to be depressed by the ongoing uncertainty caused by the UK’s decision to leave the European Union; ad spend is expected to rise by just 0.6% in real terms during 2017. Also weighing on ad spend performance will be softness in consumer spending. There are already signs from high frequency indicators of consumption that rising inflation and an associated squeeze on household purchasing power is weighing on consumer spending. This is expected to continue throughout the rest of 2017 and into 2018, and is a primary factor behind the expected stagnation of ad spend next year. A somewhat recovery is then anticipated to take place during 2019 and 2020, with ad spend forecast to rise by 1.8% and 2.3%, respectively. Q2’s survey showed that around a third of the survey panel recorded an increase in internet marketing budgets (32%), against a little over 9% of panelists that recorded a fall. That provided a resulting net balance of +22.7%, which was up sharply since Q1 2017’s +16.9% and the highest reading since Q3 2007. Within internet, search/SEO (+15.6%), and mobile (+3.0%) both continued to record upward revisions to growth. The increase in spending related to search/SEO was the highest recorded by the survey for two-and-a-half years. Mobile is one of the key drivers increasing internet budgets. Amit Dar, head of strategic partnerships, Taptica, outlines that “from this latest Bellwether report, we’ve seen eight years of expansion in internet budgets; but discerning companies know that mobile is today’s sweet spot for reaching digitally savvy customers. Smartphone penetration continues to rise and users have embraced mobile in every aspect of their personal and professional lives”. James Collier, chief revenue officer, Rainbow, feels that despite growth in adspend, those investing in mobile should proceed with caution: “It’s interesting to see that negativity around financial prospects is heavily contrasted with growth in consumer and ad spend, echoing the overall political uncertainty in the UK. The shift further towards performance and activation is at once a concern and an opportunity, however, as it pivots advertisers towards short-term gains, but allows room for more investment in innovative ways to digitally market. This is echoed by Gavin Stirrat, MD, Voluum. He outlines that there has been “increasing pressure on the industry to meet the needs of advertisers by offering protection from ad fraud, viewability, and brand safety, in addition to providing complete transparency. The first half of the year saw a number of brands pause their digital ad spend, as industry issues were thrust into the spotlight by both Mark Pritchard at P&G, and the Times investigation into YouTube, which followed shortly after. Despite these challenges, the cost-effectiveness of digital has meant that, despite issues surrounding ad fraud, brand safety, and viewability, it remains a vitally important part of the marketing mix. Some of the credit for rising digital adspend should go to publishers, according to Ally Stuart, regional director EMEA, Sharethrough. In his opinion: “Marketers investing in digital advertising is fitting with the growth and enthusiasm we’ve seen across the industry – investment continues to follow user attention and that lives in digital and, specifically, mobile. Celine Saturnino, chief commercial officer, Total Media, warns against short-termism when it comes to investing in advertising. “There are two key factors fuelling the increased digital investment: the first is the continual squeeze on advertising budgets and the pressure on marketers to prove the value of their investments in a short return period. This trend automatically attracts investment for media that can be tracked more easily end-to-end and where performance has already been proven to work – particularly in search, the historical home of ROI focused digital advertising. “The second motivation for bigger digital spends is focused on consumer behaviour. Audiences are increasingly spending more time online and on mobile for accessing and sharing information, researching, and purchasing. Investment typically follows this behaviour and, unfortunately in some cases, to the detriment of other channels that often better support long-term brand development and memorability, such as TV. 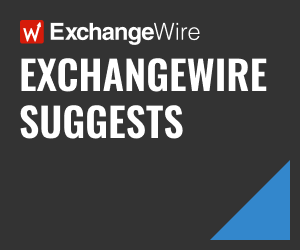 Ruth Zohrer, head of connections planning, Mindshare UK, agrees that there is a danger of “a short-term approach to marketing investment focused on more immediate wins to justify the budgets. The rise in internet budgets could signal that marketers are directing more investment to channels aimed at sales activation, potentially at the expense of long-term brand building. Likewise, we also need to recognise that technological advances have created new opportunities for internet channels to support brand building strategies, especially for the young”. Julia Smith, director of communications, Impact Radius, agrees: “It’s no surprise that the recent election and Brexit have unnerved the ad industry; and the prediction for a stagnation of ad spend in 2018 is not unexpected. However, digital is likely to weather the storm better than other channels, as long as the focus remains on delivering real results and increased revenue from digital marketing spend.